When we were dealing with single variable real-valued functions $y = f(x)$, we noted that the derivative $f'(a)$ (provided $f$ was differentiable) gave us the slope of the tangent line corresponding to the point $(a, f(a))$ on the graph of $f$. 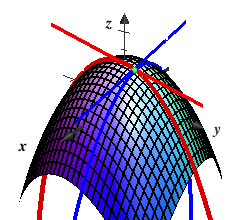 Let $z = f(x, y)$ be two variable real-valued function that generates the surface $S$. Recall from the Partial Derivatives page that for a fixed value of $y = b$, the partial derivative $f_x (x, b)$ will give us a curve $C_1$. 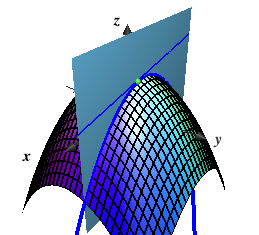 This curve is the intersection of the surface $S$ with the plane $y = b$ (in blue). For any defined value $x = a$, the partial derivative $f_x (x, b)$ evaluated at $x = a$, in other words, $f_x (a, b)$ gives us the slope of the tangent line of $C_1$ when $x = a$. Similarly, for a fixed value of $x = a$, the partial derivative $f_y (a, y)$ will also give us a curve $C_2$. 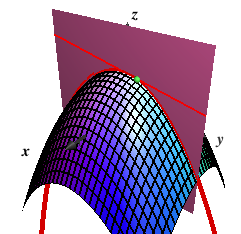 This curve is the intersection of the surface $S$ with the plane $x = a$ (in pink). For any defined value $y = b$, the partial derivative $f_x (a, y)$ evaluated at $y = b$, in other words, $f_y (a, b)$ gives us the slope of the tangent line of $C_2$ when $y = b$. These two tangent lines are important. The plane that passes through these two tangent lines is known as the tangent plane at the point $(a, b, f(a,b))$. 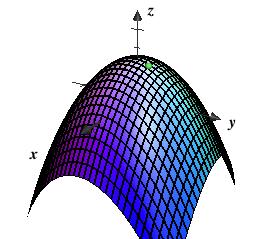 Definition: Let $z = f(x, y)$ be a two variable real-valued function that generates the surface $S$. Let $C_1$ be the curve obtained by intersecting the plane $y = b$ with $S$, and let $C_2$ be the curve obtained by intersecting the plane $x = a$ with $S$. Let $T_1$ and $T_2$ be the respective tangent lines to these curves at $(a, b, f(a,b))$. Then the Tangent Plane on $S$ to the point $(a, b, f(a,b))$ is the plane that contains both $T_1$ and $T_2$. Like tangent lines for curves; the tangent plane on the surface $S$ at $(a, b, f(a,b))$ best approximates $S$ at $(a, b, f(a,b))$. Another important property of the tangent plane at a general point $(a, b, f(a,b))$ is that any curve $C$ that lies on $S$ and passes through $(a, b, f(a,b))$ will have its tangent lie on the tangent plane.